At the end of 2009 I asked Domingo Milella if he was interested in an interview for Hippolyte Bayard, and he immediatìely agreed - even if I forced him to write his answers in English, for which I send him a special thanks. We talked about a lot of things, but especially about why and how young photographers today should embark in a photographic research devoted to an analysis of the landscape, with hundreds having produced so much in the same line over the past decades. It came out that for a photographer sometimes cinema and philosophy can be even stronger influences than most of photography around, and that classicism is still a valid aspiration for a work of art. Alla fine del 2009 ho chiesto a Domingo Milella se fosse interessato a un intervista per Hippolyte Bayard ed ha subito accettato, anche se l'ho costretto a scrivere in inglese, cosa per cui lo ringrazio ulteriormente. Abbiamo parlato di molte cose, ma in particolare di come (e di perché) un giovane fotografo debba oggi dedicarsi all'analisi del paesaggio, con centinaia di autori che hanno prodotto così tanto sull'argomento nei decenni passati. È venuto fuori che per un fotografo a volte il cinema e la filosofia possono avere maggiore influenza che tanta fotografia intorno a noi, e che un orizzonte classicista può ancora essere una legittima aspirazione per un'opera d'arte. 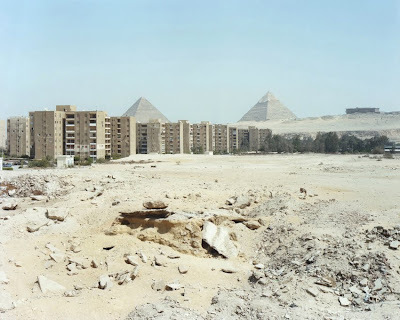 FABIO SEVERO: You graduated from the School of Visual Arts in New York, where Stephen Shore was one of your professors. 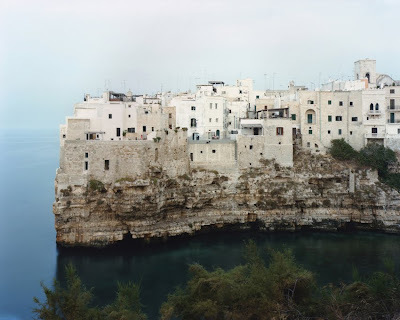 You also worked as assistant for Massimo Vitali. What was the most important experience for you between the classes and the field, and what did each of them teach you? DOMINGO MILELLA: I left my hometown, Bari in southern Italy, when I was 18 to move to New York City. I suffered a subtle and long cultural displacement. This gap of time when I was not at home anymore and had not yet ‘arrived’ in America was utterly important to my growth as a person and as an artist. This contrast between the Mediterranean provinciality and the American centrality and emancipation gave me a chance to fine-tune my own cultural identity, to influence it and inform it. The academic environment at the School of Visual Arts, and New York itself, provided total access to contemporary art and photography in the best possible way. Stephen Shore and his book Uncommon Places made a huge impact on me, both as a lesson of visual content and as a formulation of style. The work’s search for a new formulation of individual and cultural identity through the vernacular and the anonymity of the American landscape was an interesting lesson for me. 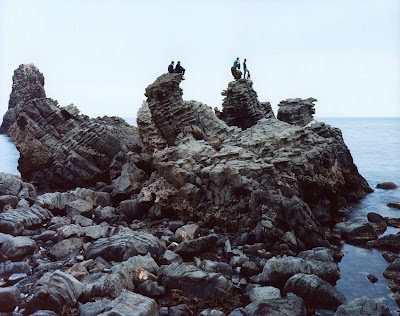 Working with Massimo Vitali has been an experience about discipline and intuition, where the rules need to be broken in order to let your own vision evolve. These encounters and their lessons helped me to develop my own intuitions and recognize the needs that I already had in my heart. FS: Your work does not evolve in series but seems to grow one image after the other. How did you get to choose this line of work, what made you feel your own way was to create one image at a time? DM: It’s a question of personality, maybe... I remember very well during the early stages of my first projects with photography that I did not really know what would be the right way to go for me. A typology like the Bechers? 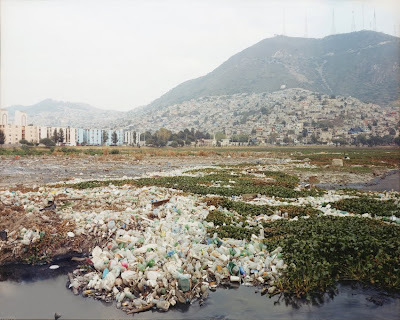 A collection of variables like Gursky’s early work or Struth’s evolution? I found that there is not a better approach than emulating the models that inspire you and to look for yourself, to search for your own way, elaborate and reformulate… From this I naturally came to make a small series about small ideas, black and white vistas of the suburbs of Bari, my home and a subject I felt drawn to portray. Soon after, I naturally departed from that order. Somehow I do still work in a series format, it’s just that I do not show everything in a serial way. Every project and every trip has a serial approach. Many images may resemble each other, yet the dialectics between the differences and similarities draws a narrative. I would say that I primarily make images of vedutas from a vantage point, but sometimes I am also shooting at the ground level, including people as well. I think it’s impossible to not work in series. Some people work within disordered repetition and others ‘order their own order’. FS: You often said your focus is on the border areas where suburban and rural world meet, those grey areas where none of the two develop fully and architecture often does not exist to be admired, but simply as a series of almost casual volumes meant to be inhabited. Informal landscape, it comes to my mind. I also remember you once described the landscape as a symptom. Which are the symptoms that a landscape can express and how can photography depict them? DM: I grew up in an area filled with big apartment buildings, at the edge of the port of Bari. My playgrounds were fields of olive trees next to piles of industrial garbage overlooking the Adriatic Sea. Near my house there were also bunkers from World War II, and some nomads camped every now and then near an abandoned country house. I think my language began developing there. I am interested in architecture that comes from the landscape, that comes out of necessity and mirrors its makers and inhabitants. Necessity is a very important factor for me in choosing the landscapes I photograph. To me, the 'human struggle' seems to be a very archaic yet contemporary subject matter. I am very concerned with the idea of community as an ancient order perhaps fading with modernity. Its social nature is becoming virtual and in the end this archaic network is mutating under the pressures of capitalism and technology. The vernacular and the anonymous are like a fortification protecting the values and needs of a community and its collective struggle. This idea of a common social base seems to be fragile in front of the praised individualism of consumerism. The fear of poverty has blinded our cultural roots leaving the economic project to design new rules for newer desires. FS: The layers of natural and urban landscape have been explored by many photographers and are still the core of many photographic works: how do you challenge yourself to keep finding your own path through this subject matter? DM: In the beginning of photography, the object photographed and the way it was photographed collided, metaphor and subject were on the same level. The purity of the grade of representation was very high. This is a fundamental aspect in using the medium. An aspect so rare in most of the photography made today. Yet, the legacy of artists who have worked within this path is what I want to respect, inform, and challenge. I hope that what I photograph and the way I choose to do it will be helpful for this tradition, and also for a new approach at the same time. Technology and digitalization allow many languages to proliferate and over-express themselves. I think that this abundance encourages a tendency for superficial formality. The priority of objects changes as well as the perception of values. There is growing attention on 'how' to do things instead of 'what' to do. What to express, and what to change has become secondary…But what are we talking about then? FS: You tend to avoid any kind of frontality or symmetry in your images, often used by other photographers as tools to dominate the landscape in front of the lens. Instead, you seem to prefer viewpoints that reveal the unbalanced, unresolved or otherwise articulated nature of the landscape, rather than summing it in absolute views. Is it something you aim at consciously? DM: Not really. I always see my images as so tight and formal. My vision comes from a desire to pay attention to things, places, times that would be otherwise lost or left unseen. The abstract art of Cy Towmbly or Blinky Palermo, as well as Italian postcards from the 70’s have been substantial elements in my visual passions. Yet, most of my primary visual guidelines come from German photography, historical and present. 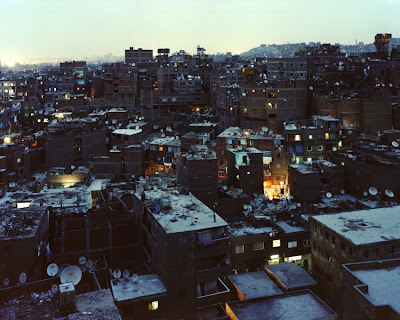 I was sure to be working in that direction, until I met Thomas Struth. I was struck by the fact that all of his remarks about my early works were about a lack of precision, as if my compositions were full of obstacles, and my message was not as clear as it could have been. It was hard to accept his opinion at first, but my composition of space was not as clear and as frontal as I belived. In a way his sharp annotations helped me to understand that my peculiar idea of formality, based on complex and often contradictory surfaces, needed to work in accordance with my subject matter and content. Classicism is, in a way, nothing other than the perfect balance of shape and content. A German as well as an Italian can agree on that. FS: Do you feel yourself as part of some kind of tradition? In a way, both biographically and photographically, you are somehow between different world: the US from one side and Europe and Southern Italy from the other, Stephen Shore and the American landscape in color, the Dusseldorf legacy but at the same time the Italian landscape photography, from Gabriele Basilico and Massimo Vitali to Francesco Jodice and Marco Zanta, to name a few. Is there any dialogue inside your work among these different traditions and roots? DM: Photography is not the most interesting ghetto if taken only in itself. Before photography, my strongest influences came from poetry, literature and movies. I started to make photographs because I liked neorealist movies. I just wanted to be able to connect with something I could see in those black and white images of a graceful Italy; a kind, humble, and elegant country during that time. Pasolini came onto the scene with his persona, ideology and beliefs. His work virtually took me hand-in-hand to thinking about my language and researching my own ideas. I watched this brief documentary a few years ago and it remains a seminal milestone for me. FS: Photography in Italy is often seen as struggling against all sorts of difficulties: lack of schools, lack of gallery and museums, of money, of magazines. What do you think of this diffused pessimism, and do you consider yourself an ‘Italian’ photographer, in terms of where your work is mainly diffused, whether it is among collectors, galleries or else? DM: I am Italian, and this is my cultural identity and environment. Italy as I like to say, is the last country of the 1st world and the first of the 3rd…making it the second world. The land in-between. I think that photography is an industrial language of modern history. Is Italy a mature modern state? Is Italy a country of innovation and research? We lack a social sense of nation. The civic education of the industrial western world in Italy is only formal, and is not truly rooted. What saves us is the esthetic nature of our land and tradition, not our present condition. The problem of photography in Italy is the same problem we have in any field of our culture today. We might be losing a legacy of education, awareness and grace. FS: But what is your perception of contemporary Italian photography? 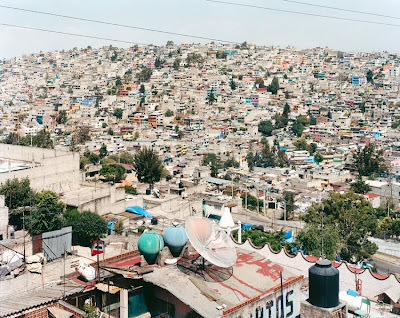 Which are the most interesting photographers and tendencies from your point of view?" DM: A few nights ago I watched again after a few years the movie by Luchino Visconti Rocco and his brothers, 1960. I was deeply moved by its dramatic simplicity and the strength of the story, as well as the film’s visual clarity, elegance and classicism. The rooted quality of those images gave me a true example for comparison in today’s visual desert. I do not see any unified contemporary cultural expression, author or movement for visual language in Italy today. It seems as if a choir of confused and broad voices makes mostly entertainment and not art. FS: The editorial market is often chosen by young photographers as the starting point to begin some kind of career into photography: agencies, photoeditors, assignments, etc. You seem to have skipped this route and went straight to making images aimed at galleries and books. How did you make this choice? DM: I think I never made that choice, for me art is art and photography is photography. There is a grammar and a language for everything. Sometimes I work on assignments, but I have established an interest in a certain idea, a certain tread, style, theme, concept…this set of rules is my artistic integrity. I never wanted to have an agency or a website, because I think that a concept’s core should not become too easy to be accessed. Total freedom can make certain values decay instead of reinforcing them. FS: What are you currently working on? Is there any new project you will release in the near future? DM: I expect changes to emerge within the pictures themselves, because I know that my own thinking pretends to understand too much, anticipating processes that can really only develop naturally. Southern Italy has been the core of my interest for the last three years, and I would like to continue working on this dense theme. Lately it feels uneasy for me to rush into new travels, new intuitions, and ‘exceptional things’. The possibility of communicating and expressing oneself so concisely and easily turns into an excuse to say anything and everything, in movies as well as in photography, in art and architecture. Not to mention Facebook, Twitter or Myspace. The editing of meaning is disappearing. The physical and abstract size of the world seems to keep shrinking in this era of fast consumption of languages and distances. Yet the specificity of cultural and geographical values still exists. The superficiality of globalization seems to be deeply illusionary. I would rather walk or go by car to remote places in the future. I am working on a more quiet approach, waiting for the desire for innovation and renewal to come from a true need. Thanks for posting this very informative article. I have learned a lot. Cheers to a wonderful 2010! Grande per aver inserito Pasolini! Le città e cittadine create nel passato erano composte da case uniformi, l'insieme aveva una logica, oggi invece (forse oggi no, oggi c'è più decedenza, forse era più un problema degli anni 50-60-70) ogni costruzione è basata solo su stessa e, come primo problema, c'è quello del tempo e del risparmio, così ecco valanghe di schifezze. Inoltre, penso che le case del passato resistono decenni e secoli, mentre quelle moderne sembrano pronte ad essere spazzate via per far posto ad altre nuove e così via all'infinito, cancellando il passato. Indeed this is a fascinating interview and Dominigo brings deep insights to landscape photography. I saw his photo essay in NYTimes magazine of Nov. 13 2011 of the Bristlcone Pines. Since I have been there and looked at and painted the trees, I can truly admire his insight and vision. 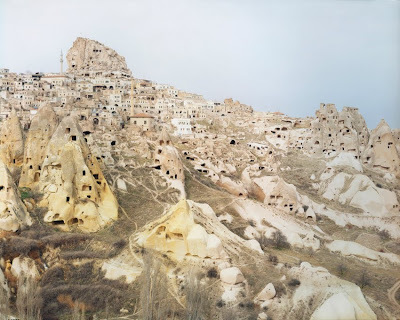 Also, this is a landscape where NO people live or ever have, so different from his previous work. Bravo! and thanks! !